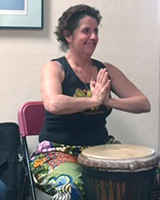 Hope is a gifted teacher who has been sharing her drumming skills and knowledge with both children and adults for over eight years, including private and group lessons, children’s camps and drum circle facilitation. She knows how to bring out the best in people and to work with them to fine-tune their abilities. Her sunny disposition, patience and motivational skills lead adults and children alike to look forward to every percussion session as a rewarding and fun experience! An aficionado of the West African Drum Community for over fifteen years, Hope has studied with African drum masters such as Mamady Keita, Bolokada Condé, Mamadou Koné and Dibo Camera. Through her teachers, she has learned and now instructs about the profound impact of the drum on physical and mental health, as well as about the depths of African Culture. Hope teaches percussion to youth and adults in Benicia, Redwood City and now Livermore. From corporate events, to team/community building, parties, weddings and more, Hope and Holistic Drum offer a fun and safe way to learn and explore.